Topics: Driving Lessons, Motorway Tuition, and Driving Instructor Training. 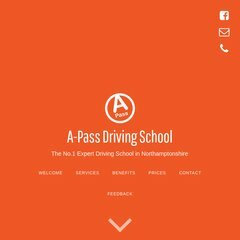 a-pass.co.uk A-Pass Driving School Northampton| Driving lessons Northampton ..
A-pass.co.uk's server IP number is 88.208.252.196. There are 3 Nameservers, ns1.livedns.co.uk, ns2.livedns.co.uk, and ns3.livedns.co.uk. It is hosted by Fasthosts Internet Limited - Uk S Largest Web Hosting Company (England, Gloucester,) using Apache web server.